I am mildly obsessed with surfing. My wife says I know way too much about various surfers in history and about surfboard construction. I can't help it, it's a topic I don't get sick of. My kids are doomed to a life of surf lessons, surf stories and wave watching. 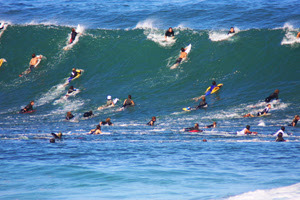 We recently went to watch the huge waves on the North Shore of Oahu. At the end of our trip, my 3 year old daughter said "that was awesome dad!" Here are some shots from that day.